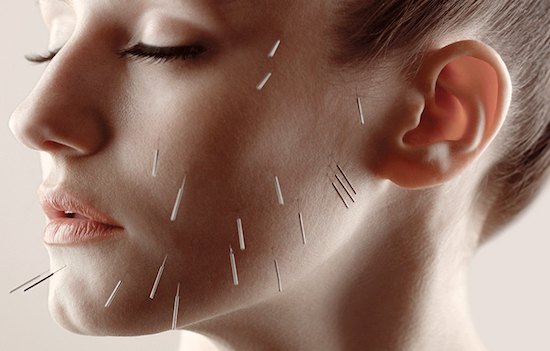 Facial Acupuncture is a non-surgical gentle treatment to help reduce the signs of aging. Such treatments are performed by trained Registered Acupuncturists in the province of Ontario. It comprises of inserting hair-thin needles into specific points in the face and body. How does Facial Acupuncture work? As we mature, collagen production is reduced, the skin loses elasticity and resilience. What Facial Acupuncture offers, in this case, is an increase of blood flow to the face, moisturize the skin from the inside due to better circulation and stimulates the production of collagen that results in a stronger more radiant skin with less visible fines lines and makes deep lines look softer. Your skin will end up looking 5 to 15 years younger. It also strengthens the facial muscles and that creates a lift effect which helps reduce the appearance of a double chin and sagging skin. The increased blood flow to the face helps to eliminate oxidants, dark circles and bags around the eyes, it also tighten the pores and adds a glow to the eyes. Is Facial Acupuncture for you? Facial Acupuncture works for everyone regardless of gender. the majority of the receivers are between the age of 30 to 60. Facial Acupuncture is a great preventative tool to slow down the effect of aging regardless of age you could begin the preventative treatments at your early 20s. How long is the course of treatment? Improvements are noticed within a couple of treatments, the effect of facial Acupuncture is accumulative, once you begin a course it is important to follow through with each session, the closer the sessions and the more consistent you are the better the results. Maintenance and preventative courses are offered once every 4 to 6 weeks, depending on skin type and it’s condition. Maintenance plans will be provided and discussed with you along with diet and lifestyle recommendations. Prevention is as important as the treatment itself. The results of facial acupuncture last from 2 to 4 years depending on age, overall health, and diet.